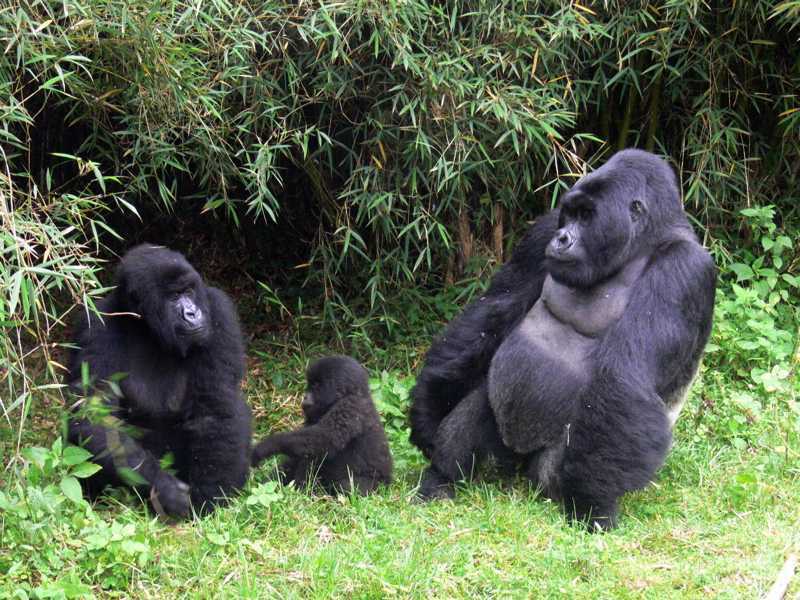 This 12 days best of uganda safari consists of uganda Gorilla Tracking, Chimpanzees Tracking, hikes and , Bird Watching and nature walks giving you different options to explore all the possibilities in uganda . Tracking the Silverback Gorillas and their families in Bwindi National Park is the foremost tourist attraction in Uganda, and possibly the best wildlife encounter in the world. Here half the world’s population of Mountain Gorillas live in this most diverse rainforest ecosystem. There are other primates here as well; Chimpanzees, Black and White Colobus Monkeys, Blue Monkeys, Grey-cheecked Mangabey and L’hoest’s Monkeys. In addition, there are 350 bird species, 200 butterflies, 27 species of frogs, 163 species of trees and 100 species of ferns. Queen Elizabeth National Park was founded in 1952 and is Uganda’s most popular park. The park, with its diverse ecosystems include huge savannah areas, shady humid forest, sparkling lakes and fertile wetlands. The Big 5 live here, as well as 10 primate species and over 600 bird species. The Kazinga Channel’s banks are lined with Hippos, Elephants and Buffaloes. The fig trees of the endless Ishasha Plains are habitat for the elusive tree climbing lions. In addition to the wildlife opportunities, there are many cultural encounters with local communities, whose people will entertain you with dances, music and storytelling. Activities in the park are many; birding, visiting Bat Caves, Chimp Tracking, Game Drives, Hiking and Nature Walks, Launch Trips plus working with the Wildlife Research Center, who monitors the birdlife and mammals in the Park. Kibale National Park is best known for its 14 specie primate population, including 1450 Chimpanzees, Red Colobus monkeys, L’Hoest’s monkeys, the Ugandan Mangabey monkey, Black and White Colobus monkey, Blue monkey, Red-tailed monkey, Bushbaby and Potto. Here in the mostly forested park, you can see these primates swinging in the tree branches together with the 300 bird species flying around. In terms of large animals, there are forest animals, buffaloes, giant forest hogs and numberous antelope species. There are plenty of activities in Kibale National Park, including Chimpanzee tracking, day hikes and nature walks, Bird Watching and night nature walks. There are Children’s activities, specifically involving the children in the chimpanzee viewing. Culturally, Kibale National Park can be an immersion in other people’s cultures easily with a community visit to the towns of Kinonik, Nyaibanda or Nyakalongo. Murchison Falls National Park is Uganda’s oldest and largest conservation area. It is located at the northern end of the Albertine Rift Valley; the park is determined by the famous Murchison Falls, where the rushing waters flow from the Nile River, through a narrow 8 meter gorge with a thunderous roar. The waters plunge 45 meters over the remnant Rift Valley wall. On the Nile River banks, once can see Elephants, Giraffes, Buffaloes, White Hippos, and of course the Nile Crocodiles. There are over 450 bird species and 76 species of mammals. In terms of activities, there are many in addition to the Game Drives. Here in the park one can be busy going on Nature Walks or Hiking, or Sport Fishing, or just viewing the animals from the water on a Launch. The opportunities for viewing wildlife are extensive; the park’s enormous size and mixed wildlife population has made it so very popular both for tourists and local Ugandans. The ZIWA RHINO SANCTUARY is most famous for the Rhinos, but within its 7000 hectares, there are over 20 mammal species and 300 bird species. The sanctuary is monitored by 80 Rangers, 24/7 and was set up primarily to preserve the Ugandan Rhino population, which was almost totally de-pleated.a few years ago. This sanctuary is privately owned but run by the Rhino Fund Uganda, under licence. The Sanctuary was established in 2005 and it has proven successful as the population of many species, in addition to the Rhino, has increased. The main activity at Ziwa is Rhino Trekking; following the Rhino on foot with a Park Ranger guide, watching their daily activities can be most interesting, and quite unique. Another popular activity is the 6 am Shoebill Canoe safari. This also allows visitors to see the variety of water birds on the Lugogo Swamp area of the Sanctuary. In addition Birding is very popular here and there are many walking trails, guided of course, throughout the Sanctuary. You will be met at Entebbe International Airport by your guide. You will be transferred to your hotel in Kampala, given a briefing of the tour and rest up for the following early morning. Depending on the time of your arrival, your Jewel Safari guide will take you on a tour of Kampala City and its environs. There are many cultural and historical sites within the city to look at, including our Catholic and Protestant Cathedrals, overlooking the city center, the King’s Palace and Lake, also within the city center and the famous tombs where past royalties have been put to rest. Kampala also has many restaurants and bars, both modern and more traditional – all of which are very entertaining. After breakfast, your guide will pick you up at your hotel and you will start your journey to Bwindi National Park. En route, you will stop over at the Equator for photos, and a coffee at the Equitorial Cafe. Lunch on the road at a local Ugandan restaurant. After lunch, you will continue your journey to Bwindi, arriving at your hotel in the afternoon. After breakfast, encounter the gorilla tracking which can take you the whole day, here you will go with packed lunch come back, afternoon you can do community walk dinner. After breakfast transfer to Queen Elizabeth national park in Ishasha sector, start the game drive expecting to see tree climbing lion, elephants, toppies, waterbucks, Uganda kob, savannah baboons, different species of birdies, lunch at wildness camp/ Savanah resort hotel. Afternoon go back for game drive dinner overnight at the same place. Early morning game drive expecting to see leopard, Uganda kob, warthog, giant forest hog, elephants, hippos from grazing going back to water, going through the crater lakes and dry craters visiting the salt lake. Afternoon boat cruise on kazinga channel which meets the two lakes (L.George & L. Edward) expecting to see the waterbucks, crocodiles, different animal coming from the water. Early morning breakfast; drive to Kibale National Park going through the crater lakes, kasanga forest, lunch at primate lodge/ Nyinabulitwa resort. Afternoon community visit to the local tea plantation and factory. Leave early morning for chimpanzee tracking at Kanyanchu headquarters, tracking starts at 8 :00 am. After lunch, you will explore the Bigodi swamp; it will be a Nature Walk. Early morning game drive to the Northern Sector where you will see lions, leopard, hyena, Jackson heartebeast, elephants, Uganda kob, patas monkey, and the unique savannah monkey. After lunch, you will be taken to the bottom of the falls, where you will encounter the Nile crocodiles, hippos, rare shoebill, bee eaters and other species of birds and animals. After breakfast you will proceed in the direction of Kampala; stopping en route at the Ziwa Rhino Sanctuary. After lunch, you will continue to Kampala and check in to your hotel. Time permitting, your guide will take you on a tour of Kampala and/or Entebbe, after which you will proceed to the airport. CASSIA LODGE is close to Central Kampala, but far enough away to be in a quiet spot by the lake. Because of the cool environment, with the breezes from the lake, there are few mosquitoes. Their restaurant seats up to 100 people, and a large part of it is outside on a terraced patio facing the lake. The bar, adjacent to the restaurant has a separate panoramic balcony. Their restaurant seats up to 100 people, and a large part of it is outside on a terraced patio facing the lake. CASSIA LODGE is located southwest of the centre of Kampala on Buziga Hill. Restaurant and Bar; room service. HUMURA HOTEL is well located in the centre of Kampala, in the Kololo section of town; near the Uganda Golf Course. They offer suites, single and double rooms; all are well appointed, self-contained and with an African flair of colours and fabrics. The bar and restaurant are well known with both visitors and locals. There is a Louge with a garden setting, only available for Humura Hotel guests; here a large selection of Scotch Whiskeys and Cigars can be found. The swimming pool has its own fully stocked bar, and the gym, for guest only is one of Kampala’s most well equipped. There is only a stream separating the Volcanoes Bwindi Lodge from the Impenetrable Forest; a truly unique Uganda jungle safari experience. The lodge has 8 Bandas for accommodation, each with a private terrace where you can sit and watch the wildlife. The Volcanoes Bwindi Lodge is a luxury accommodation, with all the modern conveniences, all with special consideration to the environment; the lodge is eco-sensitive. IHAMBA LAKESIDE SAFARI LODGE is within the borders of the Queen Elizabeth National Park, on the shores of Lake George. All the accommodation is private suites, with verandahs and sitting areas. Ihamba Lakeside Safari Lodge is near the fishing village of Kahendero, in Muhokya sub-couty, within the gates of Queen Elizabeth National Park on the shores of Lake George. pitching your own tent. In addition to the Restaurant and Bar, there is a big lounge with comfortable furniture to relax and enjoy the surrounding Kibale Forest and its wildlife. Cultural dancing is provided for guests Free Wifi in the common areas. Portal-Kamwenge Road, which is adjacent to the Kibale Forest National Park. The cottages are a few hundred meters from the main tourist centre of Kanyanchu. The rooms are powered by solar, and all have hot showers and verandas. They offer a complete bar and restaurant for their guests, and a lounge area for relaxation and viewing. The MURCHISON RIVER LODGE is located on the southern bank of the Nile RiVer. Here family cottages can be rented, as well as tenting accommodation. They also have cleared sites to do self-camping complete with cooking areas and showers. Murchison River Lodge has a bar and restaurant as well as a swimming pool and craft shop. Sambiya River Lodge is situated only 15 minutes from the top of the magnificent Murchison Falls; the perfect location for experiencing tranquility in the African wild. There are 26 double guestrooms; individual thatched cottages with en suite bathrooms, rans, screened doors and windows, mosquito nets and a private veranda for enjoying the wildlife moving around the lodge.